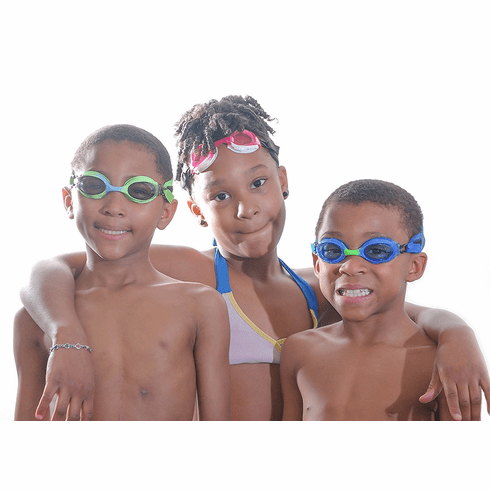 Frogglez Goggles were specifically designed to fit recreational swimmers ages 3 years and up, effectively eliminating the hassles associated with traditional swim goggles. Designed by a parent who was frustrated with regular swim goggles, Frogglez are quickly becoming the first choice for swim instructors and parents all around the world. Soft, stretchy elastic straps secure leak resistant goggles without folding over ears or sliding down the back of the head. Easy, quality Velcro attachment for size adjustments. Removable, adjustable Universal Strap attaches to most swimming goggles. Frogglez are made out of neoprene covered in a smooth, comfortable material that glides over hair, not pulling on it like traditional swim goggles do. The elastic strap is designed to adapt to most head sizes but will initially need to be stretched for a few seconds all around to adapt to larger heads. The first time you use Frogglez Goggles, stretch the strap all around and then place on the head. The advanced strap design then molds itself to the head and becomes incredibly comfortable. Edge stitching to maximize the life of the Frogglez strap.